Christa Hesselink has been guiding individuals and groups as they dig deeper into their spiritual life for her entire twenty year career. She is a well-respected keynote speaker, workshop facilitator and retreat leader, and her focus content includes: transformation & vulnerability, the inner-life of an effective leader, contemplative spirituality, grief & loss, and soul care. Christa is known for her strategic and collaborative approach to working with individuals and teams and her greatest satisfaction comes when designing compelling experiences for people to slow down so they can wake up to their own soul. She holds a Master’s of Leadership and a Master’s of Theology degree and has been named a “Hero of Children” from World Vision Canada. She is the Canadian best-selling author of Life’s Great Dare and the founder of the Love2Love Project which, to date, has given over $45,000 to vulnerable children in Syria and Mozambique. Christa is a certified coach, certified yoga instructor, and is training to become a spiritual director with the Haden Institute. 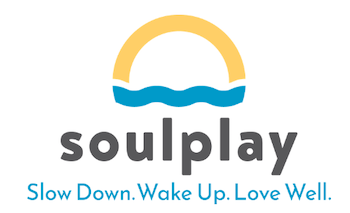 She is the founder of SOULPLAY. Christa’s “happy place” is hiking on the trail. Her favorite adventure to date has been her solo trek across northern Spain, walking 800km on the Camino de Santiago. She loves traveling to new places, devouring podcasts, practicing yoga, cooking for friends, or curling up with a glass of wine and a good book. Rooted in the Christian tradition, Christa has found deep meaning and hope, and enjoys companioning others who endeavor to deepen their connection to God - to Spirit, Source and Soul.